Fanny and Amy’s new blog is attracting first-class opportunities for the mother-and-daughter team and their NYC travel agency. It’s too bad this ride leads to murder . . . 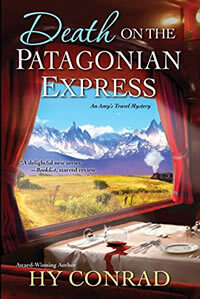 Upon the breakout success of the TrippyGirl blog, Amy Abel and her mother, Fanny, are asked to join a group of other prominent travel writers on a scenic train tour of Patagonia. Fanny welcomes the extra publicity, but it takes coaxing from suave tour owner Jorge O’Bannion to win Amy’s commitment. Once in Argentina, their South American expedition seems to chug along smoothly—despite Fanny drinking way too much yerba mate tea. But while out snapping photos for TrippyGirl, Fanny makes a dreadful discovery—a body scavenged by condors in the wilderness. Even more unsettling, the corpse mysteriously disappears before the others arrive. Some question Fanny’s sanity, but doubt becomes horror when Jorge’s angel investor is found dead in a similar position. As a number of “accidents” validate Amy’s suspicion of foul play, the Abels must outsmart one very conniving killer . . . or they’ll soon be en route to their final destination—six feet under.